Perfect for college students and apartment dwellers, the Danby DMW077BLSDD has a small footprint but doesn’t sacrifice on quality of design or performance. Although you’ll probably use it mainly for warming, it still has 10 power levels and can auto cook or defrost based on weight. We appreciated some of the common-sense features that some other microwaves miss. For example, the interior light comes on when the door opens, and the beeps are not at an annoyingly loud level. The popcorn feature also works as it should; it popped a full bag without burning it. Of course, since this is a smaller model with not as many fancy features, you may find it difficult to cook large dishes. Also, we would have liked to see an Add 30 Seconds button for convenience, but it’s not a huge deal. 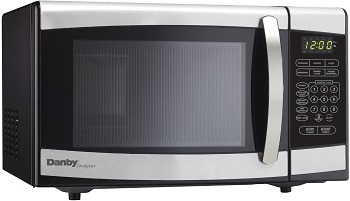 Ultimately, this Danby model is great for those on a budget or those who just desire a small, no-frills, reliable microwave.